"Leave this place. Blood will flow here this week." 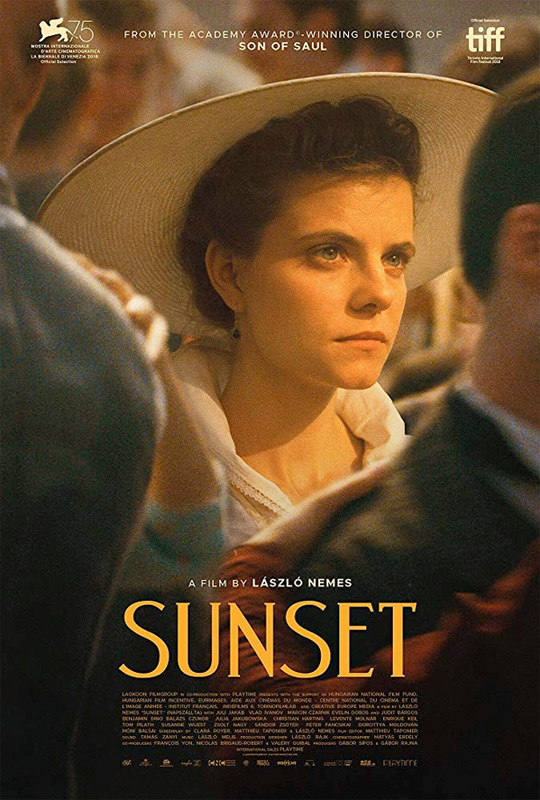 Sony Pictures Classics has released the official US trailer for the new film from Hungarian director László Nemes (of Son of Saul previously) titled Sunset, which premiered at the Venice Film Festival this year. This sprawling, epic historical drama is set in Budapest in 1913, "in the heart of Europe as World War I approaches." The story is about a young woman named Írisz Leiter, who tries to get a job at a legendary hat store that once belonged to her late parents. She ends up lost in the overwhelming chaos of a bustling Budapest. Juli Jakab stars as Írisz, and the full cast includes Vlad Ivanov, Susanne Wuest, Björn Freiberg, Levente Molnár, Mónika Balsai, Urs Rechn, Evelin Dobos, and Judit Bárdos. A remarkable feat of authentic filmmaking, this film is demands our attention. You can still watch the first festival trailer for Nemes' Sunset here, to see the original reveal this year. Set in Budapest in 1913, the film focuses on Irisz Leiter, a young woman who arrives in the Hungarian capital hoping to work at a legendary hat store previously owned by her late parents. When she is turned away, she sets on a search for a man who can reveal the truth about a lost past. Sunset is directed by acclaimed Hungarian filmmaker László Nemes, making his second feature film after Son of Saul, which won the BAFTA Award. The screenplay is written by László Nemes, co-written by Clara Royer and Matthieu Taponier. This premiered at the Venice Film Festival, and also played at the Toronto, Zurich, and London Film Festivals this fall. Sony Classics will release Nemes' Sunset in select US theaters starting in early 2019.